MPEG-2 describes a combination of lossy video compression and lossy audio data compression methods which permit storage and transmission of movies using currently available storage media and transmission bandwidth. The DVD-Video standard uses MPEG-2 video. HDV is a format for recording and playback of high-definition MPEG-2 video on a DV cassette tape. MOD and TOD using MPEG-2 video are recording formats for use in consumer digital file-based camcorders. There is a message from Apple’s official website: When using any version of iMovie, please note that you cannot import muxed (multiplexed) MPEG-1 or MPEG-2 video clips into projects. And you may find your MPEG-2 DV, MPEG-2 HDV, MPEG-2 MOD, MPEG-2 TOD are not the favorite formats for iMovie 8/iMovie 9, sometimes you can not transfer and log your MPEG-2 videos to iMovie 8/9 for editing. So if you have MPEG-2 footage to eventually make its way into iMovie 08/09, it is best to convert the MPEG-2 files to AIC MOV for iMovie 8/9. Step1. 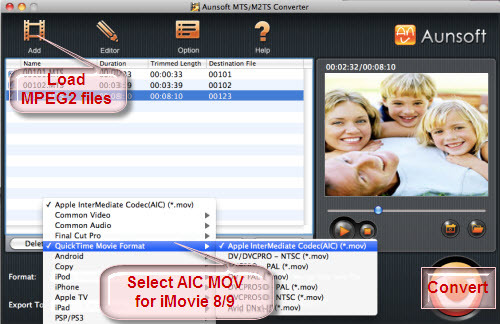 Import MPEG-2 DV/HDV/MOD/TOD files to Aunsoft Video Converter for Mac. Run Aunsoft Video Converter for Mac as the best MPEG-2 to iMovie 8/9 Converting software, and click the "Add" button to load MPEG-2 DV/HDV/MOD/TOD videos. You may also directly drag and drop the MPEG-2 DV/HDV/MOD/TOD video to application UI for importing files. Step 2. Choose Quicktime Movie Format - Apple Intermediate Codec (AIC) (*.mov) output format for iMovie 8 /iMovie 9 Without Rendering. Click the "Format" option and navigate the mouse cursor to Quicktime Movie Format > Apple Intermediate Codec (AIC) (*.mov) as output format. The Mac MPEG-2 to iMovie AIC Converter will convert MPEG-2 DV/HDV/MOD/TOD to AIC MOV with high quality. Step 3. 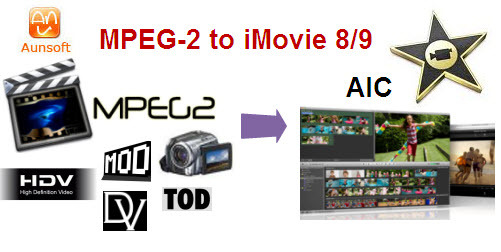 Convert MPEG-2 video to Apple Intermediate Codec (AIC) (*.MOV) for iMovie 8/9. Click the convert button under the preview window, and the Mac MPEG-2 files to AIC MOV Converter will start the conversion from MPEG-2 DV/HDV/MOD/TOD to Apple Intermediate Codec (AIC) MOV for iMovie 8, iMovie 9. After the conversion, you can easily import Converted MPEG-2 files to iMovie 8/9 without rendering for editing. How-Camera/camcorder Videos to iDVD for Burning?